It’s no co-incidence that our historic Tone Dale House has a bedroom named the Ski-ing room. So, in the interests of research, we went to Switzerland to investigate these past connections. And it was pretty cool…. Along the way to Grindlewald – the scale of the scenery was epic, and so were my heart palpitations at the (oh my god we’re going to die) steep mountain passes and yes there were even cattle complete with traditional bells round their necks. We were wowed by the historic connections dating from 1891, when Thomas and Gerald Fox of Tone Dale House were the first to take down hill skis to Grindlewald and possibly these were also the first to be seen anywhere in Switzerland. With great eccentricity Gerald put them on in the bedroom (must have had a ground floor room I guess!) and walked out of the hotel with them on. Newspaper articles show they seem to have had little luck in interesting the locals in this new sport, but gamely carried on pushing themselves along with a pole. 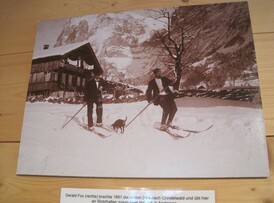 We saw the orginal skis used by Gerald and photos of him in the very lovely museum that celebrates all things alpine, it was a step back in time and these pioneers of the sport would have loved to have seen the importance of ski-ing today in this resort. This entry was posted in News on 15th October 2014 by Nick.